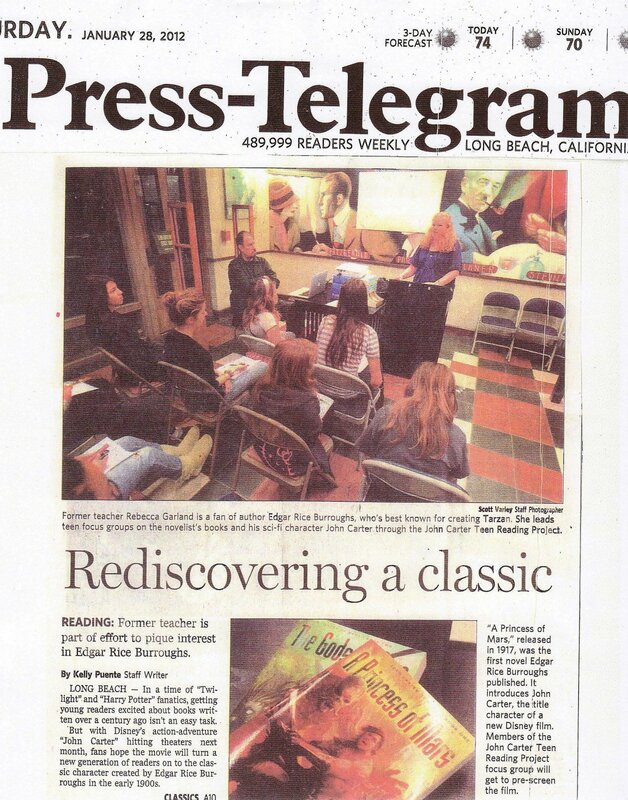 READING: Former teacher is part of effort to pique interest in Edgar Rice Burroughs. Former teacher Rebecca Garland is a fan of author Edgar Rice Burroughs, who's best known for creating Tarzan. She leads teen focus groups on the novelist's books and his sci-fi character John Carter through the John Carter Teen Reading Project. "A Princess of Mars," released in 1917, was the first novel Edgar Rice Burroughs published. It introduces John Carter, the title character of a new Disney film. Members of the John Carter Teen Reading project focus group will get to pre-screen the film. LONG BEACH -- In a time of "Twilight" and "Harry Potter" fanatics, getting young readers excited about books written over a century ago isn't an easy task. But with Disney's action-adventure "John Carter" hitting theaters next month, fans hope the movie will turn a new generation of readers on to the classic character created by Edgar Rice Burroughs in the early 1900s. 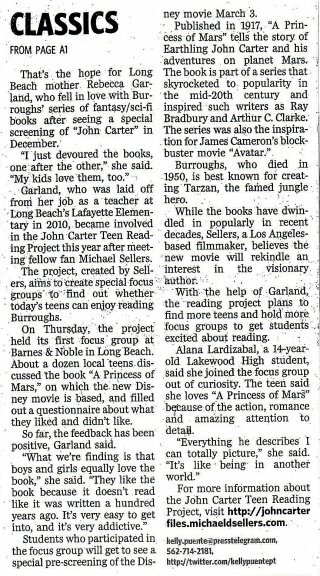 That's the hope for Long Beach mother, Rebecca Garland, who fell in love with Burroughs' series of fantasy/sci-fi books after seeing a special screening of "John Carter" in December. "I just devoured the books, one after the other," she said. "My kids love them, too." 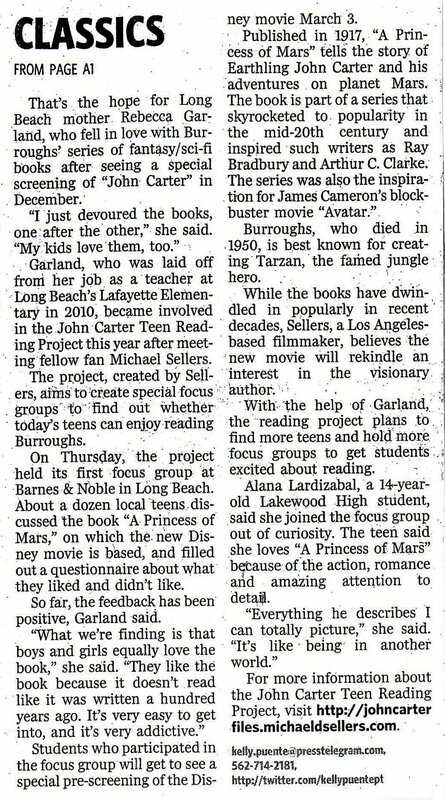 Garland, who was laid off from her job as a teacher at Long Beach's Lafayette Elementary in 2010, became involved in the John Carter Teen Reading Project this year after meeting fellow fan Michael Sellers. The project, created by Sellers, aims to create special focus groups to find out whether today's teens can enjoy reading Burroughs. On Thursday, the project held its first focus group at Barnes and Noble in Long Beach. About a dozen local teens discussed the book "A Princess of Mars," on which the new Disney movie is based, and filled out a questionnaire about what they liked and didn't like. So far, the feedback has been positive, Garland said. "What we're finding is that boys and girls equally love the book," she said. "They like the book because it doesn't read like it was written a hundred years ago. It's very easy to get into, and it's very addictive." Students who participated in the focus group will get to see a special pre-screening of the Disney movie March 3. Published in 1917, "A Princess of Mars" tells the story of Earthling John Carter and his adventures on planet Mars. The book is part of a series that skyrocketed to popularity in the mid-20th century and inspired such writers as Ray Bradbury and Arthur C. Clark. The series was also the inspiration for James Cameron's blockbuster movie "Avatar." Burroughs, who died in 1950, is best known for creating Tarzan, the famed jungle hero. While the books have dwindled in popularity in recent decades, Sellers a Los Angeles-based filmmaker, believes the new movie will rekindle an interest in the visionary author. With the help of Garland, the reading project plans to find more teens and hold more focus groups to get students excited about reading. Alana Lardizabal, a 14-year-old Lakewood High student, said she joined the focus group out of curiosity. The teen said she loves "A Princess of Mars" because of the action, romance and amazing attention to detail. "Everything he describes I can totally picture," she said. "It's like being in another world."